The first part of a series about ”handy tools” – various problem solver units that can work wonders for your rig. As usual, when I start a series of articles, there is no real timeline as to when the following parts will be written and posted. But I’ll get there, any year now. 🙂 Anyway, in this article we meet the ever useful, but ever under-appreciated, Boss LS-2. The pedal has input and output jacks, and send/return jacks for loops A and B. The incoming signal is buffered, then split three ways: to the output mixer/buffer, to loop A send and loop B send. If left empty, the send/return jack in each loop are connected internally, to simply pass the signal along. Each loop has a level control, located after the return jack. The return signals then join the main bypass signal in the output mixer/buffer, and is then sent out through the output jack. Depending on which mode is selected, this means the pedal can be used as a three-way input selector, a three-way output selector, a parallel effects mixer, a booster, an A/B pedal etc. A<->B: This mode simply alternates between loop A and B active. A<->Bypass: Loop A or bypass. B<->Bypass: Loop B or bypass. A+B Mix <-> Bypass: Both loops active in parallel, or bypass. This is useful if you often switch between different guitars that have wildly different output levels. Set the LS-2 up first in the chain, in A->B->Bypass mode. Plug the guitar into the main input, and go out to the rest of the chain from the main output. The LS-2 will now serve as the main buffer, and bypass mode is your baseline level while A and B can be adjusted to create two alternate signal levels. If you only need one alternate signal level, use A->Bypass mode instead. Basically the same as above, but this time we will also use separate cables for the different instruments. Normally, I’d advise against using multiple guitar cables, since it very quickly becomes a tangled mess. But if you have a synthesizer, theremin or some other sound source you want to be able to run through the pedalboard, or for that matter a lap or pedal steel, it is very handy. Set the LS-2 to A->Bypass mode, and use the main input for the regular guitar cable. The steel guitar/synth/theremin/whatever plugs into return A, and its signal level can then easily be matched using the level control. Using A->B->Bypass mode will allow you to use two additional sources, or you can use the extra loop to level match different guitars plugged into the main input. Tip: in that case, I’d leave loop A empty, to cycle between normal guitar -> level adjusted guitar -> synth/theremin/steel guitar. If you want to be able to quickly switch between two pedals, or two groups of pedals, the LS-2 can do this. For instance, to select between two distortion pedals with just one stomp, A->B->Bypass mode will let you cycle through clean (bypass), distortion 1 (loop A) and distortion 2 (loop B). If you use A<->B mode instead, you can set the LS-2 up as a clean/dirty switcher. Run everything you need for your clean tone (compressor, chorus etc) in loop A and everything you need for the dirty tone (overdrive, distortion etc) in loop B. Pressing the switch will alternate between the two chains, which really cuts down on tap dancing. Either mode can of course be used to quickly audition two different (or very similar) pedals, to see which one sounds the best (or spot differences there are between them) without having to plug/unplug cables. Use A+B Mix <-> Bypass mode to run both loops in parallel. For instance, you can run two distortion pedals in parallel. If you set one up with very little low end and the other with very little top end, or one with scooped mids and the other with lots of midrange, you can get some really cool sounds. A variant on the above, but this time leaving one loop empty, which makes that loop carry the dry/clean signal. You can then use the level controls to mix in the right amount of dry and effected signal. This setup is extremely useful if you have a pedal where the effects sound great, but where the dry signal gets digitized as well, causing a latency shift when you turn the pedal on/off (Line 6 DL-4 is one where I’d want to use this setup). Set the effects pedal up with ”kill dry” or 100% wet (this is important! If there’s dry signal coming from the effects pedal as well, you will get phase issues) and set the right amounts of dry/wet signal using the level controls. Simply turn off the LS-2 to bypass the whole shebang. If you have more than two arms 🙂 you may want to play guitar and use a synth/tone generator/whatever at the same time, all through the same pedalboard. Again, A+B Mix <-> Bypass mode comes to the rescue. Simply connect the guitar to the input, and add whatever other signal source you want to return A or B. Leave the other loop empty, and you will now be able to set the level of the guitar and that other signal source using the level controls. Or insert yet another external signal source in the return jack of that loop, and those two signals (without the guitar) will be mixed together and send to the output jack. Step on the LS-2 to go to bypass mode, leaving just the guitar feeding through to the output jack. Keep in mind that you don’t have to send the synth/tone generator/whatever through the whole pedal chain – you can easily place the LS-2 at the point in the chain where you want to insert those sounds. For instance, if you run the guitar through wah->distortion pedals and then into the LS-2, the noises you add there from the synth will only be affected by the pedals that sit after the LS-2 in the chain (chorus, delay or reverb, for instance). And of course, the synth can have its own set of effects, prior to joining the signal chain via the LS-2. While I do not advocate summing a stereo signal to mono, due to a host of problems – phase issues being chief among them – the LS-2 can do that for you in A + B Mix mode. Use the two returns for left and right outputs from the stereo effects, and you’ll see a summed mono signal at the output jack. Switching the LS-2 to bypass will mute the whole chain (since there’s nothing connected to the input jack). The LS-2 can easily be set up as a booster. Just place it where you’d want to boost the signal, and leave both loops empty. A->Bypass mode lets you set up one boosted (or cut) level, while A->B->Bypass mode gives two alternate level settings. Naturally, you can insert an effect into one of the loops, to combine boost/cut with that effect. For instance, you could have normal level/boosted level/boosted level with an EQ (or phaser, or delay, or whatever you’d like). Since the LS-2 is fully buffered, it can also serve as a buffer at the end of the chain, to consistently drive the cables to the amps. And if you set it up in Output select mode, you can split the signal to three amps. Step on the pedal to cycle through the three outputs (output/send A/send B). It should be said that the LS-2 does not provide isolation, so you will not be immune from ground loop hum. While the example above equates to an A/B/C switcher, sometimes we just want to be able to switch between two amps (A/B). And if we also want to be able to feed both amps we’d use an A/B/Y pedal. Naturally, the LS-2 can do both functions, albeit with a little tweaking. For A/B selection, the obvious choice would be to use A<->B mode, and connect send A and B to the two amps. Simply step on the pedal and select which amp you want to hear. But there’s another way to do this, which opens up a few more possibilities. To do A/B switching, use A->Bypass mode. The output jack connects to one amp, and send A to the other. Step on the pedal to alternate between the two. For A/Y selection, switch over to A+B Mix <-> Bypass mode. This time, bypass mode will still send the signal through the output jack to its amp, but active mode will send signal to both amps. If you have an amp without a master volume (or where the master volume is twitchy and tricky to set to a reasonable volume level) that has a series effects loop, the LS-2 can be used to control the signal level. Amp fx send goes to LS-2 input, and LS-2 output goes to amp fx return. Use any of the single loop modes (A->Bypass or B->Bypass), activate the pedal and turn the level down to the desired level. Turning the LS-2 off will get you the volume the amp is actually set at (meaning you have access to a lower ”rhythm” volume and a higher ”lead” volume). If bypass is too loud, use A<->B mode instead and set the two levels to where you want. A->B->Bypass mode will give you three different volume levels. Note: Be aware that with some amps, if you turn the channel volumes up really loud (to use the LS-2 as a master volume), the signal level may end up being too much for the LS-2. And while it may go without saying, I’ll say it anyway: never, ever, connect the LS-2 (or any other effects pedal) between the amp and the speaker. The LS-2 is not a power attenuator, and you will damage both the pedal and the amplifier. 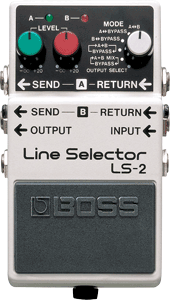 Footnote: Thanks to reader Tomislav Simić for additional suggestions on how to use the LS-2!